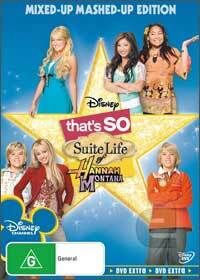 You got to love those TV series crossovers which has your favourite characters mixing together and "That's So Suite Life of Hannah Montana" brings three Disney classics together that include "That's So Raven", "The Suite Life of Zack and Cody" and "Hannah Montana". That's right, this DVD stars all the stars from these three highly popular Disney TV series, however in its essence, the movie basically contains three episodes from the TV series that have been linked together by characters crossing over. The first part of the story involves Raven as she attempts to organise a photo shoot at the swish hotel where Zack and Cody are staying which also moves onto Hannah Montana as an encounter with Raven's friend Maddie convinces Hannah's father to rekindle his music career again. The best of the disc is that of Raven herself with her over the top acting and humour that goes a little slow with Zack and Cody and then rejuvenates itself against with Hannah through the talents of Miley Cyrus and Billy Ray Cyrus. Featuring great made for TV video and audio quality, the DVD also contains some entertaining special features and if you are a fan of all three series, than this disc has been made specifically for you. Definitely one for the kids!